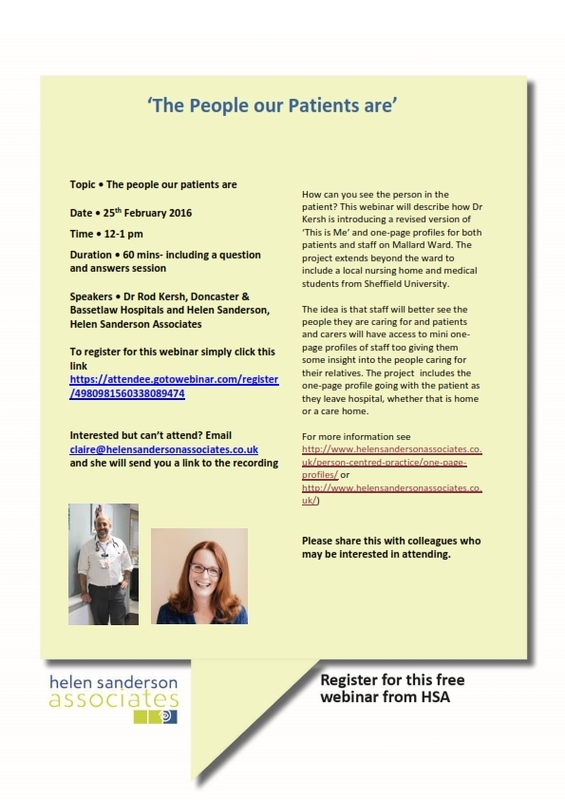 Dr Rod Kersh from Doncaster & Bassetlaw Hospitals and Helen Sanderson are hosting a webinar on 25th February at 12 noon. How can you see the person in the patient? This webinar will describe how Dr Kersh is introducing a revised version of ‘This is Me’ and one-page profiles for both patients and staff on Mallard Ward. The project extends beyond the ward to include a local nursing home and medical students from Sheffield University. The idea is that staff will better see the people they are caring for and patients and carers will have access to mini one-page profiles of staff too giving them some insight into the people caring for their relatives. The project includes the one-page profile going with the patient as they leave hospital, whether that is home or a care home.